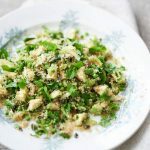 This healthy vegetarian recipe is from a book by Lisa Roukin, My Relationship with Food, and it makes a lovely nutritious lunch which you can prepare in advance. It’s also great for dinner, especially on warmer days as it’s a meal you leave it to cool down to create a delicious salad. 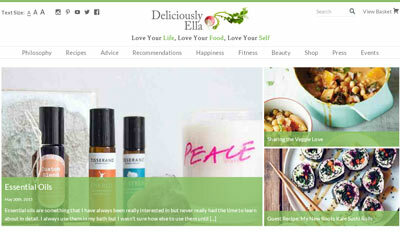 Lisa Roukin is an experienced chef, having been demonstrating healthy, contemporary cooking to London’s young professionals, families and children since 2008. 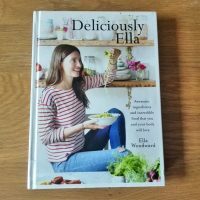 She currently provides the world’s largest online supermarket, Ocado, with gluten-free recipes. 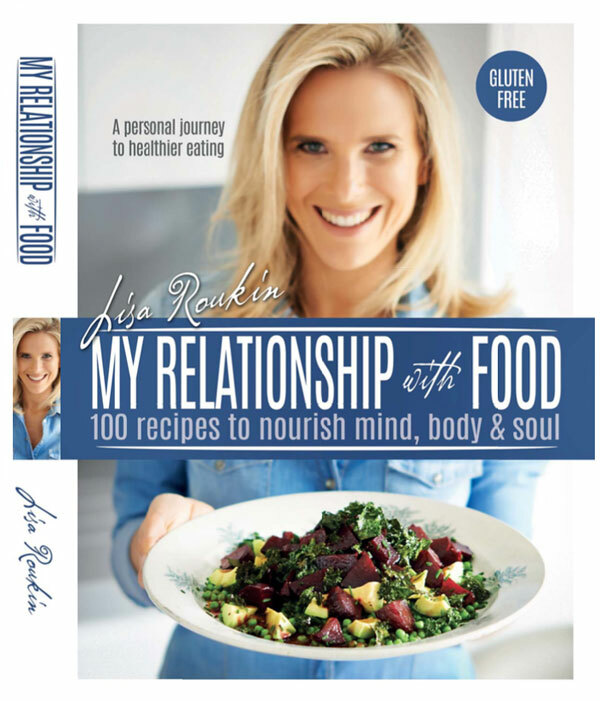 Her book, My Relationship with Food, is not only full of healthy and nourishing recipes, it also contains tips on becoming healthy and nourished – these are especially great for people who are struggling with their weight and have an unhealthy relationship with food. Lisa’s early relationship with food wasn’t a healthy one, she was a fat child actually as she writes in her book. She went from one extreme to another and became a thin teenager but she was unhappy and not healthy. It took her some time to deal with her unhealthy patterns and find a balance. There is quite a big variety of recipes in the book so you can choose from vegetarian meals, chicken recipes, beef recipes, soups, seafood recipes and sweet treats. There is something for everyone actually. All the recipes are gluten-free. A summertime salad balancing soft sautéed leeks and crunchy seeds. Rinse the uncooked quinoa through a sieve with cold water, for 2 minutes, then drain well. 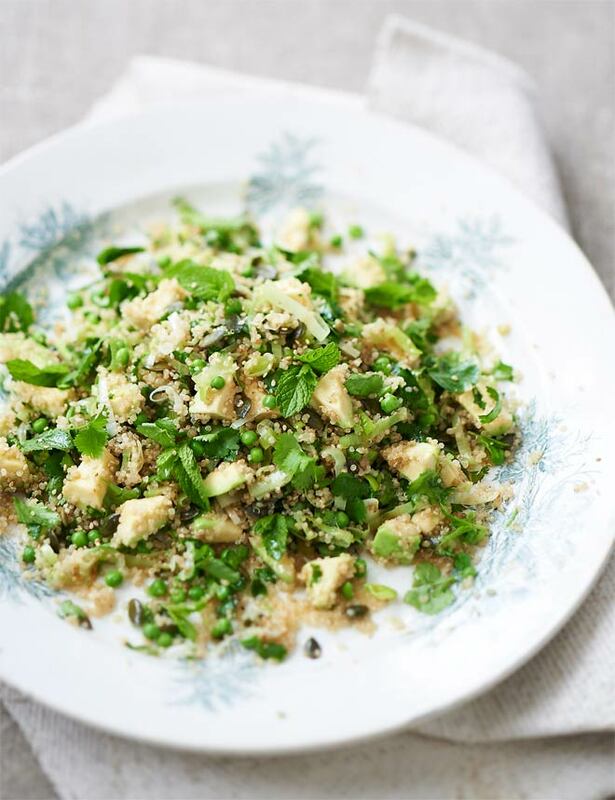 Place the quinoa in a medium saucepan with 400ml cold water, bring to boil, cover and simmer on a low heat for 15 minutes. Remove from heat, carefully fluff with a fork, cover and stand for 5 minutes, then spread onto a large flat platter to cool. 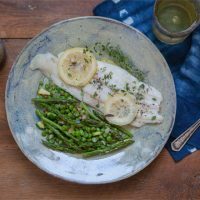 In a large non-stick frying pan, add the oil, sauté the sliced leeks until translucent and soft, season with sea salt, white pepper and garlic granules. Add the frozen peas to the sautéed leeks and continue to cook for 5 minutes, then remove from heat to cool. Add sautéed leeks to the cooked quinoa, add the pumpkin seeds. In a measuring jug, add the olive oil, apple juice, honey mustard, agave nectar, sushi seasoning vinegar, season with sea salt and black pepper. Add the chopped mint, coriander and toasted sesame seeds. When the salad is completely cooled, add the cubed chunks of avocado, mix through the salad then pour over the dressing. You can follow Lisa on Twitter, Facebook and Instagram. Also check her website here.